Stable isotope labeled cellular biomass can be used in both proteomic and metabolomic investigations. In addition, quantitative, proteomic MS-based studies can benefit greatly from the use of purified, labeled intact protein as internal standards. The use of properly folded, labeled intact proteins are ideal internal standards because they will mimic, as close as possible, the physical and chemical properties of the target endogenous protein in a sample prior to, during and after digestion. In particular, they will undergo a similar degree of proteolytic cleavage as the unlabeled counterpart, thus improving the accuracy of th e IDMS experimental result for both middle-down or bottom-up methodologies. 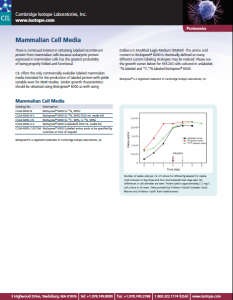 CIL is pleased to offer labeled cell growth media for E. coli, insect cells, yeast, and eukaryotic cells. Specific human proteins may be overexpressed in a variety of cell types using these media in conjunction with recombinant techniques so that one can obtain a relatively large amount of labeled purified protein for proteomic studies. 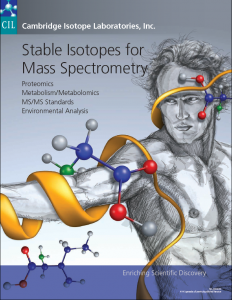 If you are interested in any of these products then please download our Stable Isotopes for Mass Spectrometry catalogue here. If you wish to discuss any of these products or get a quotation then please don’t hesitate to contact us. Celtone® Complete yields a growth rate comparable to LB media, allowing for inoculation and induction within one working day. Glucose levels range from ~0.3 to 0.6 g/ L, depending on the batch. Celtone® Complete is a ready-to-use medium that does not require dilution or pH adjustment. Each lot is tested for sterility, cell growth and protein expression. Celtone® Complete is available in 0.1 L and 1 L sizes. Please see page 139 of the catalogue for a complete listing of Celtone® Complete products. Celtone® Powder is CIL’s most flexible nutrient-rich media. The advantage of Celtone® Powder is that researchers can formulate a custom medium based on their specific research needs. Depending on cell line and desired performance, this powdered media can be used at concentrations ranging from 1 g to 10 g per liter. Truly exceptional performance has been achieved using 10 g of Celtone® Powder in 1 L of medium containing M9 salts, 2-3 g/ L of glucose and 1 g of ammonium chloride (see graph on page 52). Because it is a powder, this product has the longest shelf life of any fully rich bacterial cell growth medium. Please note that if deuterium labeling is desired, D2O must be used in media preparation. Also note that it is normal to have insoluble material present after dissolution. This material may be removed using filter paper prior to sterile filtration and will not affect performance of the medium. Celtone® Powder is available in 0.5 g and 1 g packaged sizes. Please see page 139 of teh catalogue for a complete listing of Celtone® Powder products. 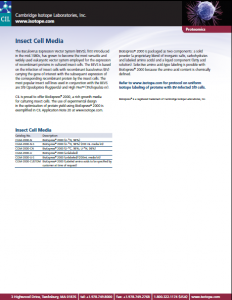 CIL is pleased to offer labeled cell growth media for E.coli, insect cells, yeast and eukaryotic cells. Specific human proteins may be over-expressed in a variety of cell types using these media in conjunction with recombinant techniques so that one can obtain a relatively large amount of labeled purified protein for proteomic studies. 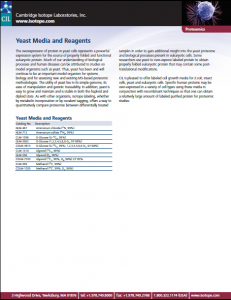 Please see page 138 of the catalogue for a complete listing of yeast media and reagents. design in the optimisation of protein yield using BioExpress® 2000 is exemplified in CIL Application Note 20. BioExpress® 2000 is packaged as two components: a solid powder (a proprietary blend of inorganic salts, carbohydrates and labeled amino acids) and a liquid component (fatty acid solution). Selective amino acid-type labeling is possible with BioExpress® 2000 because the amino acid content is chemically defined. Please see page 138 of the catalogue for a complete listing of BioExpress® 2000 products. 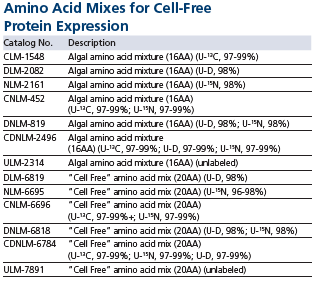 CIL offers the only commercially available labeled mammalian media intended for the production of labeled protein with yields suitable even for NMR studies. 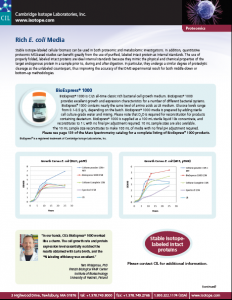 Similar growth characteristics should be obtained using BioExpress® 6000 as with using Dulbecco’s Modified Eagle Medium (DMEM). 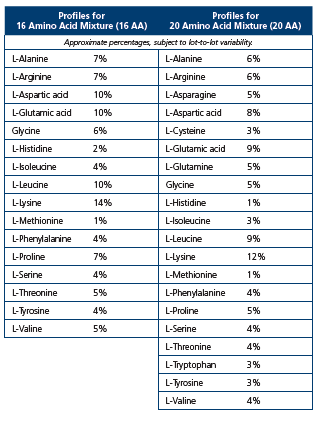 The amino acid content in BioExpress® 6000 is chemically defined so many different custom labeling strategies may be realised. Please see the growth curves below for HEK293 cells cultured in unlabeled, 15N-labeled and 13C,15N-labeled BioExpress® 6000. Please see page 138 of the catalogue for a complete listing of BioExpress® 6000 products.